Exceptional fossils provide vision of how 390-million-year-old animals stayed out of sight. A trilobite species from western and central New York possessed spotted patterns. (ISNS) -- Leopard-like patterns of spots on the shells of extinct horseshoe-crab-like trilobites may be the strongest evidence yet that the ancient armored creatures protected themselves with camouflage, according to researchers. Trilobites are distant, extinct relatives of lobsters, spiders and insects, resembling horseshoe crabs in appearance. These armored creatures prowled the seas for roughly 270 million years, longer than the age of dinosaurs lasted, and died off more than 250 million years ago, before dinosaurs rose to dominance. New species of trilobites are unearthed every year, making them the single most diverse class of extinct life known. Scientists analyzed more than 25 exceptionally preserved 390-million-year-old specimens of the trilobite species Eldredgeops rana collected from central and western New York. When these creatures were alive, the area lay under the middle of a long, narrow tropical inland sea, consisting of mostly shallow and likely quite clear waters stretching from what is now Quebec to Georgia. The trilobites lived alongside a wide range of life, such as corals, sea lilies, other trilobites, snails, clams, nautiloids kin to the modern nautilus, and fish, including shark. "It is not clear what exactly the trilobites ate, except this species most likely scavenged, feeding on whatever they could find on the sea floor," said Christopher McRoberts, an invertebrate paleontologist at the State University of New York at Cortland. These specimens were first discovered by amateur paleontologists Steve Mize and Markus Martin in the summer of 2011. Most were unearthed from gray, blocky mudstone in a creek in the town of Darien, N.Y. — the fact they were stuck at odd angles within the earth suggests the approximately inch-long creatures may been caught in a storm that tossed them around before they were buried. Most of the specimens bore spots on the upper surfaces of their exoskeletons, dots about one-hundredth to one-half of a millimeter wide. These spots were often either dark brown circles with relatively sharp boundaries or somewhat lighter brown or tan spots with a thin but distinct darker halo or rim. A few trilobites with darker brown to black shells had tan or white spots instead. These dots, made of tiny spheres embedded in the trilobite exoskeletons, were not randomly scattered across the surfaces of the creatures — they were concentrated in symmetrical patterns on the surfaces above and below the eyes and along furrows on their backs. The number of spots varied across specimens, from fewer than 100 to more than 500. Color is only very rarely preserved in such ancient fossils, raising the question of whether the scientists were mistaken in thinking these spots were natural parts on the trilobites' bodies. Supposed dots on the shells of trilobites have been seen and argued over for nearly a century. "The preservation of any indication of almost pristine original shell structure, including possible color patterns in ancient organisms, is extremely rare, because shell chemistry and structure usually changes to some degree in ancient organisms," said paleontologist Nigel Hughes of the University of California at Riverside, who did not take part in this research. However, microscopic and mineral analysis revealed the spots on these fossils were in fact parts of their exoskeletons. "The presence of a consistent pattern in multiple specimens, plus associated structural and chemical differences in the areas of the skeleton associated with the spots, lead to reasonable confidence that these structures were present when the animal was alive," said Hughes. "We have clearly documented that the spots are part of the original skeleton and are of biologic origin, not some artifact of the fossil preservation process," McRoberts said. "The trilobites would have appeared spotted in life." These leopard-like patterns of brown spots on lightly colored exoskeletons and white dots on darkly colored shells would have served as camouflage to hide from predators looking for a meal on the sea floor. 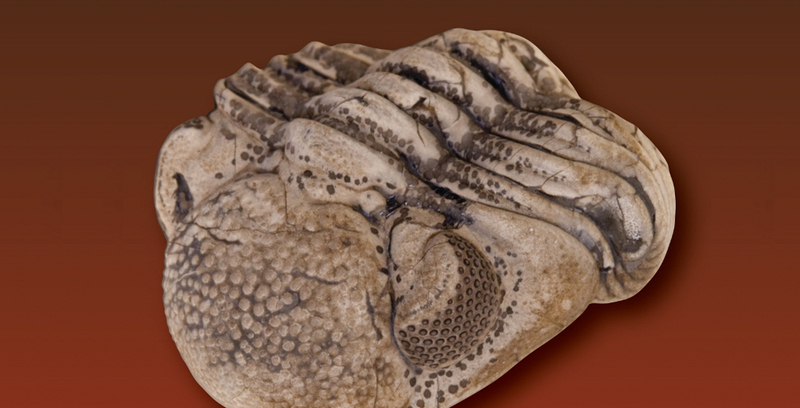 "As viewed from above or obliquely, the spots would serve to disrupt the visual outline of the trilobite and also, depending on ambient light, mask surface features of the trilobite skeleton — skeletal ridges, grooves, and eyes — that might perhaps allow recognition of the trilobite by a predator," McRoberts said. The researchers now want to learn more about the microscopic structure of the material making up the dots, "perhaps giving us some idea of color or transparency of the spots," McRoberts said. McRoberts and his colleagues would also like to look for other spotted trilobites, both of E. rana from other areas and times and also in other species. The researchers detailed their findings online March 18 in the journal Geology.